Clean and constant power is something that we take for granted here in the Americas. Sure, we've seen rolling blackouts in California before, and that outage in the Northeast back in 2003 was decidedly uncool, but those are the exception to the norm. Right now many Japanese citizens are dealing with power problems in the wake of the devastating tsunami, but in parts of Russia unreliable power is a decidedly reliable part of day-to-day life. So, what's going to happen when a couple-hundred-thousand fans from around the world swoop into Sochi in 2014, along with a flotilla of international media and all the world's greatest athletes? The Winter Olympics will happen, and the power will flow. It has to, and it will thanks to that unassuming looking shipping container above. It's being assembled at Ener1's facility outside of Indianapolis, and it's actually a giant battery holding an amazing one megawatt-hour of power. That's enough to juice 1,000 average homes for an hour, or to act as the mother of all UPS's. Join us for a look inside and a video show how each of those packs is made. 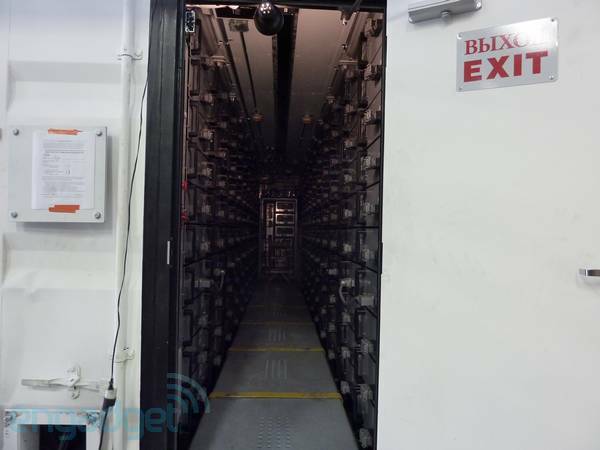 Inside the giant megawatt batteries that will power Russia's Sochi Winter Olympic Games (video) originally appeared on Engadget on Wed, 30 Mar 2011 13:41:00 EDT. Please see our terms for use of feeds.